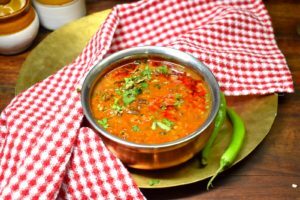 What is Amritsari Dhaba Dal? Dal preparation with rare combination and earthy and subtle flavours is Amritsari Dhaba Dal. 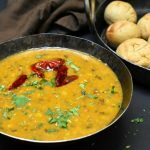 Whenever I hear the word dhaba dal the lentil I think of is toor/arhar dal. 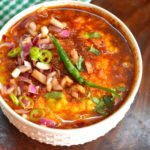 I was surprised to see sabut urad dal being used for the Amritsari dal recipe along with Rajma and chana dal. Yes Amritsari Dhaba Dal has a combination of these three dals with the flavours of garlic, tomatoes, butter, fenugreek leaves etc. 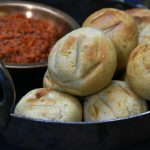 It can be served with paratha, naan or rice. I learnt how to make Amritsari dal in Nita Mehta’s “Taste of Amritsar” book. 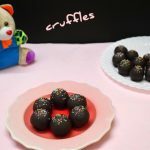 As I already mentioned the combination attracted me and I was tempted to try this recipe. Dhaba recipes have different texture and flavours, gravies are not the smoothest, the dishes have some smoky flavour. I love to use chopped vegetables for my dhaba recipes instead of purees etc. However with tomatoes I just torch them on my gas stove, to get rid of the skin. It does two things. When tomatoes are added they cook properly and fast and there is a hint of smokiness in the dish. It is a traditional Amritsari Punjabi dal so lots of butter has been used. Enough oil has been used to prepare the tempering. Garlic and fenugreek leaves do complete justice to this dhaba style Amritsari dal! 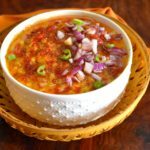 Other dal recipes on the blog are dal fry, dal Bukhara and many more. Dal fry is one of the most common dal of Indian households. Find the recipe here. 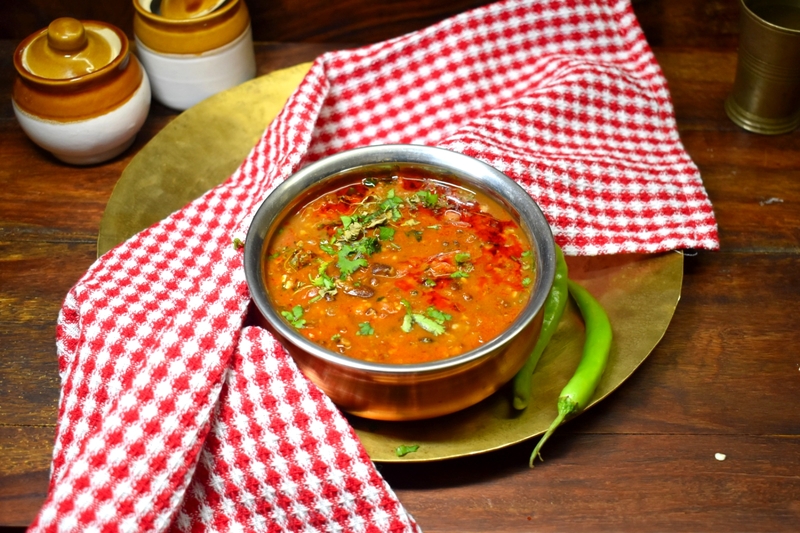 Dal Bukhara is basically dal makhani taken to an all together different level. Find the recipe here. 1. Pressure cook ½ cup sabut urad dal, ¼ cup chana dal, ¼ cup Rajma with 4 cups water and salt to taste. Cook till 4 whistles on high flame, thereafter for 30 minutes on low flame. 2. Let the pressure release. Check the dal should be cooked. 3. To torch tomatoes, use a knife or tong and place the tomato on gas stove. Keep rotating. You will find the skin begins to tear apart. 4. Let it cool down a bit. Remove the skin and chop the tomatoes. 5. To prepare the tempering, heat 3 tbsp oil. Add 2 chopped onions. Cook till onions become brown. 6. Add 1 tbsp chopped garlic and 2 slit green chillies. Cook for 2 minutes. 7. Next goes in 3 torched, peeled and chopped tomatoes. 8. Cook till oil oozes. 9. Time for spices, add 1tbsp red chilli powder and ½ tsp cumin seeds powder. Cook for 1 minute. 10. Pour prepared tempering in cooked dal. Simmer for 10-12 minutes. Add water if required. 11. To prepare second tempering, melt 2 tbsp butter. (As mentioned melt and not heat butter or it will burn. Furthermore to avoid burning of butter, first add 1 tsp oil and then the butter. This will prevent burning of butter). 12. Add 1 tsp Kashmir red chili powder. Cook for 30 seconds. 13. Add on the dal at the time of serving. Check seasoning and consistency. 14. Garnish with chopped coriander leaves and dry fenugreek leaves. Serve with masala paratha and sirke wala pyaaz. Bon appétit. 5. To prepare the tempering, heat 3 tbsp oil. Add 2 chopped onions. 6. Cook till onions become brown. 7. Add 1 tbsp chopped garlic and 2 slit green chillies. Cook for 2 minutes. 8. Next goes in 3 torched, peeled and chopped tomatoes. 9. Cook till oil oozes. 10. Time for spices, add 1tbsp red chilli powder and ½ tsp cumin seeds powder. Cook for 1 minute. 11. Pour prepared tempering in cooked dal. Simmer for 10-12 minutes. Add water if required. 12. To prepare second tempering, melt 2 tbsp butter. (As I mentioned melt and not heat butter or it will burn. Furthermore to avoid burning of butter, first add 1 tsp oil and then the butter. This will prevent burning of butter). 13. Add 1 tsp Kashmir red chili powder. Cook for 30 seconds. 14. Add on the dal at the time of serving. Check seasoning and consistency. 15. Garnish with chopped coriander leaves and dry fenugreek leaves. Serve with masala paratha and sirke wala pyaaz. Bon appétit.